Hurricane Mitch, the most-deadly Atlantic hurricane in 200 years, stalled over Honduras for two days in October 1998 causing extreme flooding and destruction and leaving over 15,000 people dead or missing. Years later, the damage to the country’s physical and social infrastructure has yet to be overcome. Families were torn apart by death and thousands of children were orphaned. Arvil Smith and his wife were serving as Baptist missionaries at the time and witnessed the devastation first hand. While driving through the streets after the hurricane trying to determine how they could help, they became aware of the many homeless and abandoned children. Overwhelmed with sadness for these children, they knew they had no choice but to reach out and do something. 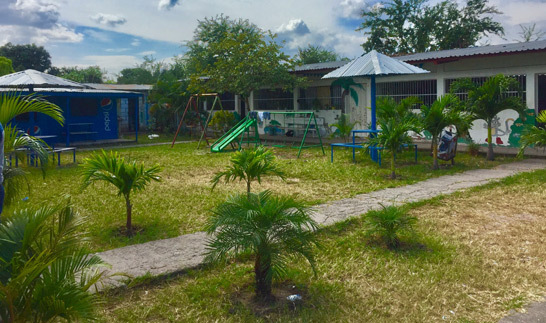 The Smiths remained faithful to their vision and soon after Hogar de Amor was built, consisting of a children’s home, a Christian school, and a church where Pastor Smith preaches. He and his wife, Miriam, are the “parents” of the children, having dedicated their lives to them. In the future, they hope to build a medical facility to complete another necessary facet of the children’s care. But God demonstrates His own love for us, in this: While we were still sinners, Christ died for us.